Is someone outside doing something in their yard this early on a Monday? Oh wait, I'm out doing stuff, actually planting a shrub in my friend's house next door, so why shouldn't others be outside, too? Tap, tap, tap, tap, tap, tap, tap. 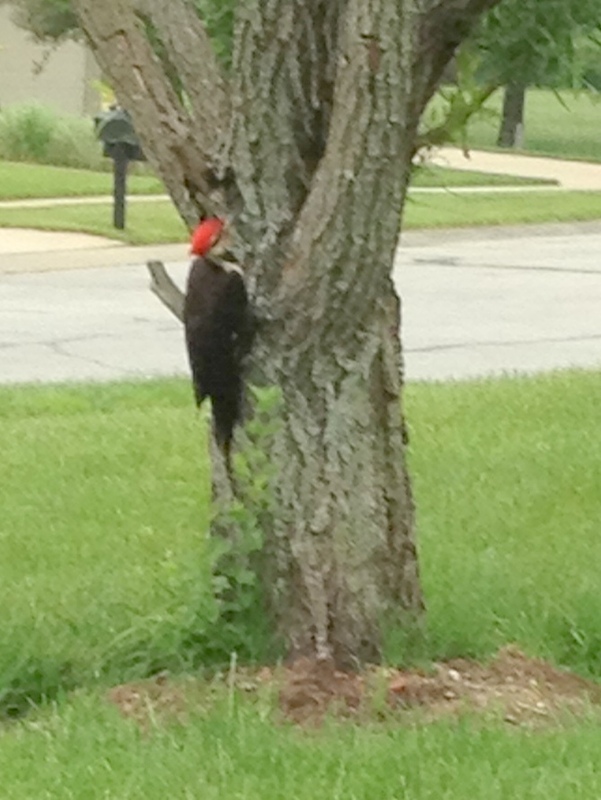 Oh my blooming radishes, is that a giant woodpecker looking for insects on the neighbor's half-dead willow tree? Click, click, click, I took pictures with my iPhone. Then I did what anyone would do. People are excited when someone sees an unusual bird close up. It's actually a pileated woodpecker, probably a female. 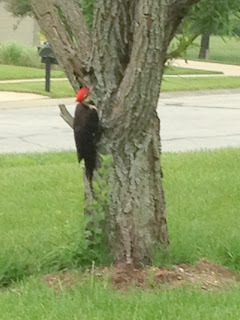 Pileated woodpeckers aren't often seen in wide-open subdivisions. They generally stay in wooded areas. This one must have come from the wooded area behind the houses across the street. I wonder what happens when you tell the story of the pileated woodpecker on a blog post? People get really excited, that's what! How cool is that...I think I might have been a tad scared though. You are very brave to have taken that photo! Cool - so close - ours a VERY shy and I only see them from a distance. We have seen up to three pairs of the Pileated Woodpeckers at one time in our neighborhood. They sound like jack hammers and look so prehistoric! They get very excited, too! They are such beautiful birds! We have a lot of woodpeckers in the area, but I've never seen a Pileated one. People get all excited and think you are one lucky lady to have one so close to home. Aren't you the good neighbor planting a shrub for a neighbor. What a wonderful blessing to have one visit you! Now, every time you think of it, think of it's larger cousin, the Ivory-Billed Woodpecker, that you and I and other gardeners helped into extinction by wanting the mulch made from their cypress swamp habitat. I was so lucky a couple of years ago to watch a mother pileated feeding two young ones and teaching them to tap, tap, tap up high in a big old sycamore tree. This was in the yard next door to my daughter's house at 54th and Illinois. We were able to watch through binoculars for 15 minutes or so. In the heart of an urban neighborhood, the birds seemed not to know, or to care, that cars and buses were whizzing by below them. My first post here, I believe. OKaaay. Now I think I'll post pix of cool birds on my facebook page. Thanks! How blessed you are to get such a good photo! I find them quite shy. One jack-hammered a dead tree in our yard, and I saw it on my elderberry tree eating elderberries. But what I love is their song, it makes me think I live in a jungle.